With mussel season in full swing, now’s the time to get cracking on this recipe for moules frites with a creamy sauce enriched with Västerbottensost®. The aioli and homemade cheesy chips complete this heavenly supper, perfect for mopping up any leftover broth. A surprisingly simple recipe which combines the best of both French and Swedish cuisine, this is a dish that doesn’t skimp on flavour. Known as the ‘king of cheeses’ in Sweden, Västerbottensost has been made using the same secret recipe since 1872. It was made by accident one day when Ulrika Eleonora Lindström, a dairy maid, was distracted from her work by a romantic interlude which caused the cheese to develop its unique character. Västerbottensost is available to buy in Waitrose, Ocado and Selfridges. Melt the butter in a large saucepan with a lid and fry the shallots, garlic, chilli and ginger. Add the wine and allow to boil for 1 minute, then pour in the cream and add the 200g of Västerbottensost. Allow the cream to reduce until just a third is left. Add the mussels and put the lid on. Leave to cook for 5–7 minutes or until all the mussels have opened (discard any that have not). Add the lemon juice and garnish with dill and the rest of the grated Västerbottensost. Meanwhile, make the chips by peeling the potatoes and cutting into 1 cm thick strips. Deep-fry in oil at 110 °C for 4–5 minutes. Take out the chips and raise the temperature of the oil to 165 °C. Deep-fry until they turn golden. Leave to drain on kitchen paper. Make the aioli by whisking the egg yolk in a bowl and add half of the oil, 1 tsp at a time to stop it curdling. Mix in the lime, garlic and salt and carefully whisk in the rest of the oil until it reaches a thick consistency. Grate the cheese over the chips and sprinkle over parsley and salt to taste. 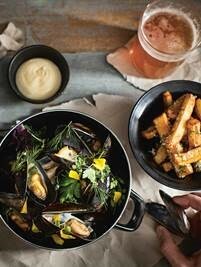 Serve with the mussels and aioli.